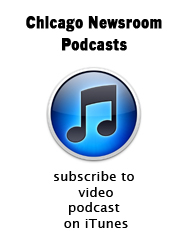 Our thanks to Alden Loury of the Chicago Reporter for filling in this week as host. Ken’s jury trial is wrapping up, and he’ll be back next week. We expand our horizons well beyond Chicago this week – all the way to the Mississippi, in fact. Carol Felsenthal (Chicago Magazine) and Chip Mitchell (WBEZ Radio) dissect the Democrats’ new redistricting maps and try to figure out who’s being forced to run against whom. It’s not a big shock to learn that the Republicans don’t do well under this new plan. The State budget will affect many Illinoisans in many ways, but early childhood programs will take a big hit, according to Mitchell. The education cuts have Governor Quinn so perplexed, Felsenthal says, that he might actually take a stand against them. The big winner, they tell Alden, is Mayor Emanuel. Riding the phone lines, the mayor appears to have won at least five legislators over to the pro-casino column, and with all the other “sweeteners”, including suburban and downstate casinos, it seems certain to become law. All in all, enough news to fill a half-hour – with barely a mention of Rod Blagojevich.